This is Windows ONLY problem! The problem is the fact that the SDK uses STL for the SDK:TXString representation. On Windows, the STL is compiled differently between Debug and Release configurations. So, when a plugin is compiled in Debug configuration, it cannot run with the Release Vectorworks. In fact, it will cause Vectorworks to crash! The solution is to change the Debug configuration so it would build like-release, but still support debugging so the plugin code can be stepped through and variables monitored. The existing Debug configuration is not needed. You should delete it in the Configuration Manager. Right click on your project and select properties. 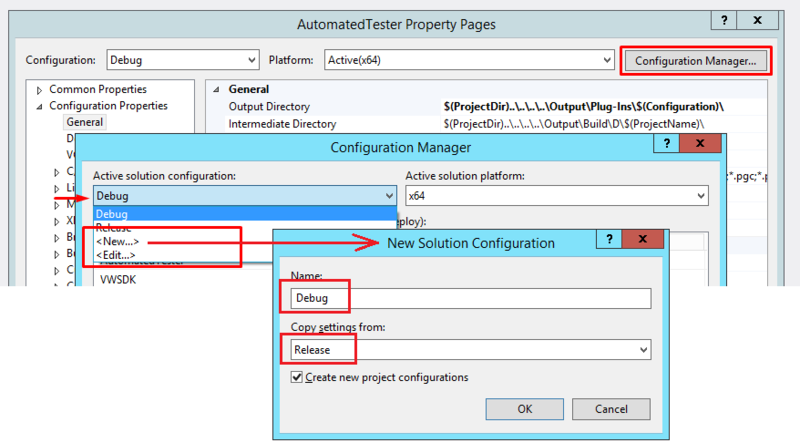 Create a new Debug configuration that is based on the Release configuration. Edit the Debug configuration to make it debug-like as it is based on Release because of the way we created it. Make sure the Debug configuration is selected. Disable Optimization in C/C++ -> Optimizations pane. Enable Generate Debug Info and the Generate Program Database File in Linker -> Debugging pane. The new Debug configuration is based on Release, which will make VisualStudio use the same STL as the release distribution of Vectorworks. The PDB (Program Database) file will be used by VisualStudio when debugging the plugin. This file contains information how the binary code relates to the source code and allows the debugger to step trough the source text files. Info: The source files are not part of the PDB file. You have to have them on the machine where the PDB is used. Lastly, we've turned off the optimizations as this will make the debugging easier. Without this the binary code will not match the source code perfectly as the compiler will optimize the calls and the usage of memory. This will make debugger possible but strange, as the execution will just from place to place and variables will not always have correct values. This page was last modified on 15 March 2019, at 09:07. This page has been accessed 1,098 times.